Sunday mornings I seem to find myself humming hymns as I make the coffee, take a walk, and start getting dressed for church. Maybe it’s the new year, maybe it’s the time of life, or maybe it’s just God’s Spirit, but I woke this morning with the old hymn Hold To God’s Unchanging Hand in my head. Our older son Philip was not an easy baby to put to bed. It seems like we would spend hours rocking and patting and singing quietly to him to coax him to give up and go to sleep. We had the usual repertoire of lullabies that parents our age knew, but because we had to have LOTS of songs, we often slipped into some of the older, quieter hymns from our childhood. One of Philip’s favorites from those old songs was Hold To God’s Unchanging Hand. The chorus almost pulsates with the emphasis on each word, and even baby Philip quite quickly picked up the refrain and would start singing it with us—much to our chagrin, since we were trying to get him to go to sleep! But it was sweet as well. Hold To God’s Unchanging Hand was written by F.L. Eiland, a 19th century pioneer of church music in the Restoration Movement. He not only wrote many hymns himself, but he, along with others, published hymnals and started Southern Development Normal in Waco, Texas, a school for educating those who would learn more about music. You can find out more about him at http://www.therestorationmovement.com/eiland.htm . I have always loved the song because in music and lyrics, it speaks truth about God’s faithfulness, especially His steadfast love! Time is filled with swift transition! If the days were short in the 19th century, imagine how much shorter they feel to us in the 21st century! Our electronic calendars delete the days, weeks, months, and years of our lives with very short keystrokes! Fifty-year-old neighborhoods are knocked down for new houses, five-year-old Ipods are throwaway toys for our grandchildren as we move on to Ipads. You realize one day that everyone in your favorite old movie is dead now! Naught of earth unmoved can stand! Trust in Him who will not leave you, /Whatsoever years may bring, /If by earthly friends forsaken/ Still more closely to Him cling. Sherrylee and I were driving the other day and talking about how many of the people with whom we were closest twenty-five years ago are now not part of our lives any more. One or two have died, some have moved—actually we moved away—some have changed, some are divorced and remarried, and a few just don’t like us anymore! The emphasis on relationships and community that postmodernism has reintroduced to us is absolutely wonderful and certainly more godly than an every-man-for-himself society, but we are foolish if our faith is in relationships with people instead of God! Only God will never leave you! When your journey is completed . . . I could never remember the third verse because the tradition in our church was always to sing only the first, second, and last verses. Life has a last verse too and it comes so quickly that you wonder if you haven’t skipped a verse or two in life as well. Brevity makes it even more important to sing the last verse well! Build your hopes on things eternal. Hold to God’s unchanging hand! 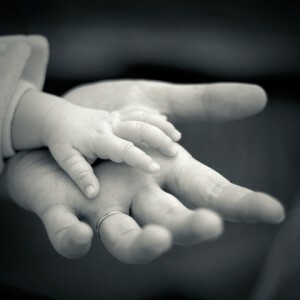 Next time you see one of those cute pictures of an old couple, or a dad and his daughter, or a baby and its grandmother holding hands, let it remind you of God holding your hand. And don’t be afraid of all those changes and transitions and new chapters and abridgements—because He will never let go! Hold to His hand, to God’s unchanging hand! Let that pulsating refrain be your heartbeat –and you’ll sleep better every night of your life. WHAT A MESSAGE! VERY ENCOURGING WORDS. Great song. Thanks for reminding us of this. Good thoughts, Mark, to move on into the new year. Pass on to Philip that we had also fits with Matthew—our first born—when it came to setting him down to go to sleep. But, I think I recall he got over that by about months, so not old enough to start singing along to the refrains of classic hymns. “Hold to God’s Unchanging Hand,” carried me through many a dark hour last year in my battle with cancer. Anne, we all watched you hold on! Don’t quit! I promise you, Mark, I won’t quit. This morning, while I’m recovering from major surgery, I have spent 3 hours “working.” E-mailing about – an LST family Team who want to serve in St. George, wrote 4 others about God’s Children’s work, discussed God’s Children’s business with a Board Member for 30 minutes. Time IS filled with swift transition. That is why we’d be wise to hold to God’s unchanging hand. Mikey’s favorite lullaby was “Blessed Assurance”. I must have sung it while rocking him to sleep hundreds of times. We had it sung at his funeral a year ago yesterday. It was the one English hymn that we chose. “Time IS filled with swift transitions.” At midnight December 31, 2010 all our family talked to one another and joyfully and hopefully wished one another “Happy New Year.” At 5:26 a.m. Annabelle and I got the phone call that jarred us awake to tell us that Mikey was dead. What a transition. . . Thank you for sharing this sweet but painful memory with us, Molly. Blessings and peace to you! Good at lifting my spirits for the day! Great thoughts, Mark. Thank you.